When people think of animal shelters, they mostly think of cats and dogs, whether it be cute little puppies and kittens or mangy unwanted crossbreeds, but the fact is, shelters see a large variety of animals, even when the bulk is still cats and dogs. Case in point: my little buddy above. The shelter I worked for a few years back had night deposit cages, actual locking kennel cages accessible from the outside, with food and water and heated from inside, that allowed people to drop off found (“stray”) or owned but no longer wanted (“surrender”) animals after normal operating hours. They were asked to fill out a form detailing either the location where the animal was found, or the circumstances of its surrender, but you can imagine how that goes. So one morning after a rather cold fall night, we found this gal (I believe) in one of the cages, with no other information. When I say the cages were heated, this is relative – furred animals would be okay, but reptiles requiring a much higher base temperature of roughly 30º c (85º f) were not going to be happy. So when we discovered the iguana, she was in a state of torpor and very cold, with minimal response. She was medium-sized for a Green Iguana (Iguana iguana, no, seriously,) roughly 30cm (12 in) in body length not counting the tail, which doubled that. Iguanas can get up to 1.5 m (5 ft) in length overall, which would have made my next action a bit harder. To warm her up, she got tucked against my chest inside my winter jacket with a warmed bag of Lactated Ringers solution serving as a hot water bottle, and there she stayed for half the day as I worked at my desk, sweating like a pig. 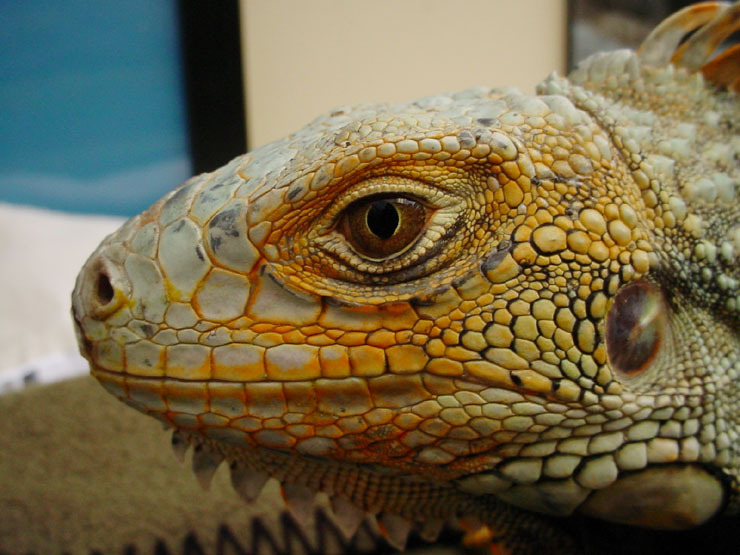 Meanwhile, since I was inexperienced in iguana care, I contacted Triangle Iguana Rescue nearby, whose volunteer kindly provided me with critical care information should I be successful in getting the poor thing past the very dangerous condition she was in. By early afternoon, the iguana was responding to the warmth and started moving about alertly, so I transferred her into a cage in my office (where I worked as administrator) and set up a heat lamp. Initially, she was semi-force-fed baby food, because her system probably wasn’t up to full digestive power, and in a few days she was convinced to eat on her own. Iguanas are actually fairly high-maintenance pets, since they require specific temperatures and UV levels, and a diet of fresh prepared vegetables and fruit with vitamin supplements – you cannot feed them on any commercially available food pellets and expect them to be healthy. Her muted color might actually have been testimony to such a poor diet before. I remember getting razzed by other staffmembers regarding the amount of time I spent preparing her food, but frankly, if you’re going to do it, do it right. We did eventually find an adoptive home for her, after interviewing the new parent fairly rigorously, again coached by Triangle Iguana Rescue. While they could have simply taken her off our hands, they were loaded themselves, and this does not appear to have changed since then. The exotic animal pet trade is a problematic and frustrating one to many animal advocates, including most animal shelters. Too many people get pets based on their “cool factor,” uniqueness, fad appeal, and other similar reasons, never realizing that such pets are rarely adapted to domestic life and require much more care than dogs and cats. When the novelty fades, the animal gets discarded – sometimes to overloaded volunteer organizations, sometimes to night deposit boxes (to be fair, I cannot vouch that this simply wasn’t a found escapee that someone kindly turned in, but there’s no way of knowing either.) Iguanas, like virtually all reptiles and amphibians, have little personality to speak of and do not warm up to their owners, do tricks, or learn to use a specific potty spot – they simply lack the brainpower, and the best that can be said is that they have particular temperaments. Improperly handled, they can be dangerous, but even in the best of conditions, a significant cage space must be devoted to them – picture “aviary” rather than “cage” in this case, since they need room to climb, higher temperatures than most households prefer, specific spectrum UV lighting, very high humidity, and nice cleanable surfaces. Because of this experience, naturally when the next four iguanas came into the shelter over a period of time, they all got to stay in my office. A couple were monsters, close to maximum size, but the first was the little girl above, who even shows faint traces of greenish-yellow baby food on her snout in the photo, taken a few days after her arrival (as well as some dark patches from rubbing against the less-than-ideal cage we had available.) Not many people can say they wrote monthly reports with an iguana stuffed in their armpit, so you know that goes right to the top of my résumé.